At the Windows 10 event, Microsoft CEO Satya Nadella claimed that "Windows is the best place, it's the home for the very best Microsoft experiences." But does that ring hollow when Microsoft launches tools like Sway on iOS before anywhere else? We asked him if Microsoft had been waiting for the always-up-to-date Windows as a service to make it easier to put Windows first for new tools. "For sure, it allows us to be in a much more continuous flow," Nadella told TechRadar. "But the way I don't want to measure ourselves is some temporal changes. There might be reasons why I don't want to just release an app for Windows – because the way we can bring things together in Windows is seamless. Take Skype. The way Skype and Windows come together, we can do a lot more in terms of integrating with the core messaging scaffolding in Windows, which I can't do on the Android device or on the iOS device." Being best is more important than being first, he told us. "I know sometimes people measure us by the time – but that is immaterial in the long run. What matters is 'have you done a better job of making our experiences feel like home on Windows?' That's our real goal and that's what we're going to stay focused on." So it isn't just about Windows getting a great version of Microsoft apps and services; it's about bringing them together in Windows in a way Microsoft just can't do anywhere else. Making things available on other platforms doesn't mean that Microsoft views as just another platform and Nadella is clear that Microsoft needs to make Windows users feel they matter to the company. "That's absolutely right and we have to do a better job of explaining that they should feel the love with the work we do. Take OneNote and the Spartan browser. Having a OneNote app on other platforms is not the same as building OneNote as a core experience to annotate the web. That is the kind of thing that I mean, when I say Microsoft experience are going to be at home in Windows and we can do a much better job there." It's not about whether Microsoft is cool or not; to Nadella it's whether Microsoft is innovating. "I want us to stand for what is it we can do as a company and have our best work in and have people love us for that innovation." The free Windows 10 upgrade isn't about giving Windows away (especially to companies); it's more about making sure Windows 7 doesn't turn into another Windows XP, hanging around for years. "There are two things we are really focused on; one is to really make sure Windows 10 is a fantastic upgrade experience for even Windows 7 customers, even on the desktop with a mouse and keyboard. It's familiar but you can get all this new value. And then we hope that one year promotional offer really helps a lot of Windows 7 customers move over." Nadella made it clear that Microsoft will still be selling Windows. "There is no fundamental shift in our business model. We want to be able to service our customers more, like an internet service. Our goal is to run one of the largest internet services that enables people to use Windows on an everyday basis. That's the way we approach it." If there is a shift, it's in what Microsoft wants us to think of as a PC – like Surface Hub. 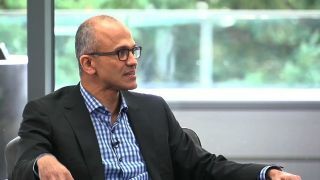 "I think of it as enterprise TV," said Nadella; "I want it in every conference room and every newsroom." The features in Surface Hub like Skype for Business and OneNote are available on other devices and platforms – but again, Nadella wants them to be best on Surface Hub because it's integrated together so the technology gets out of your way. "The thing I love about Surface Hub is that we've always been struggling with what does it mean to join a meeting; how do you collaborate once you join a meeting and then how do you leave a meeting with all the notes and annotations? It's taking that scenario and completing it – that's what we have with Surface Hub."